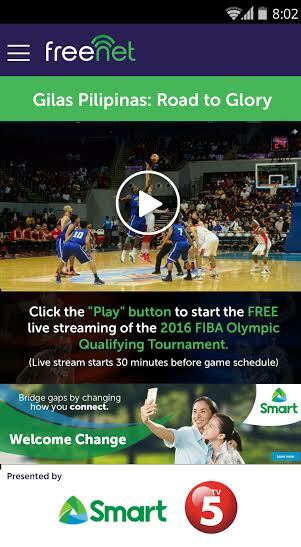 We basketball fans all over the country can throw our support behind Gilas Pilipinas wherever we are by tuning in to the mobile livestream of the Philippine team games at the FIBA Olympic Qualifying Tournament via the Freenet app (formerly SafeZone), available for FREE download and FREE from data charges for all Smart, TNT, and Sun Subscribers nationwide. All we have to do is download the Freenet app from the Google Play Store or the SafeZone app from the Apple App Store or the Google Play Store and register to the service to catch the FIBA qualifiers on our mobile phones wherever we are. This is made possible by PLDT and Smart's digital innovation arm Voyager Innovations in cooperation with Sports5 and TV5, the official broadcaster of the qualifying games. "Just last week, Pinoys witnessed history unfolds as they watched the inauguration of President Rodrigo Duterte through Freenet on their mobile devices. Today we're once again letting all Filipinos from Luzon, Visayas, and Mindanao express their support to the Philippine team for the historic Gilas bid for the 2016 Rio Olympics through their phones - all for FREE for Smart, TNT and Sun users nationwide," said Manuel V. Pangilinan, Chairman at PLDT, Smart and Voyager Innovations. Through Freenet, basketball fans can watch the Philippines vs France game at 9PM on July 5 (Tuesday) and the Philippines vs New Zealand at 9PMon July 6 (Wednesday) even if they are still in the office or braving the heavy traffic going home. Led by former NBA player Andray Blatche, the 2016 Gilas Pilipinas pool is composed of Terrence Romeo, Jeff Chan, Jayson Castro, Gabe Norwood, Ranidel De Ocampo, June Mar Fajardo, Marc Pingris, Japeth Aguilar, Ray Parks, Ryan Reyes, and Troy Rosario. And if the Philippines emerges on the top of the Manila FIBA qualifiers, they will earn the solitary spot for entry into the 2016 Olympic Games to be held in Rio de Janeiro, Brazil in August. Dubbed the "free and fun way to connect," Freenet likewise offers fans an avenue to support the Philippine team by providing free basic social media access to Facebook, Twitter, and Instagram through the app, so they can be the so-called "digital sixth man" of the team during the games. They can do this by sharing words of encouragement and support on their accounts along with the hashtags #LabanPilipinas, #SmartGilas, #GilasTime, and the fan-favorite #PUSO or "hear," which has captured the spirit of the team in the tournaments. "We're a basketball-crazy nation, and we're also known as the social media capital of the world. So it's only natural for Pinoys to show their support to the Gilas Pilipinas team through digital means, and we're more than happy to give them that avenue through Freenet. Let's once again unite and rally behind our national team - by watching the games live, on TV, or through mobile!" said Benjie Fernandez, Chief Operating Office at Voyager. During the free mobile streaming of the Duterte inauguration, the SafeZone app became one of the top trending app searches in the Apple App Store - signifying a sea change in the way Filipinos participate in national events, which is increasingly going mobile. Aside from the free mobile livestreaming and social media access, users may also use the Freenet app to access a select number of apps and mobile sites. To date, about 70 brands and enterprises are already using the Freenet platform to allow their users to access their sites and apps for free.